I only saw 17 films and 4 of those were repeat viewings. I saw 8 new movies in theaters although I fell asleep during Schlop Trek Beyond. Surprisingly I saw twice as many movies in theaters compared to 2015, but much less movies overall (17 compared to 45). In my defense other bears were often hogging the computer when I wanted to watch a flick. 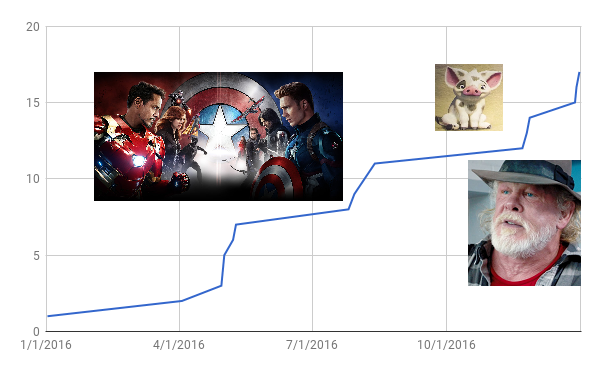 In May I went on a Marvel binge where I rewatched 3 older Marvel movies to prepare for seeing Captain America: Civil War. It's important to go in prepared for a movie like that. Then I saw a bunch of movies in November and December when I was hanging out with Lee in St Louis and Estes Park. I normally do a top 5 but there weren't enough good movies to fill out my list. I did like Moana even though Pua wasn't featured as much as I would have liked. I did get to see 7 movies with Lee which is cool.